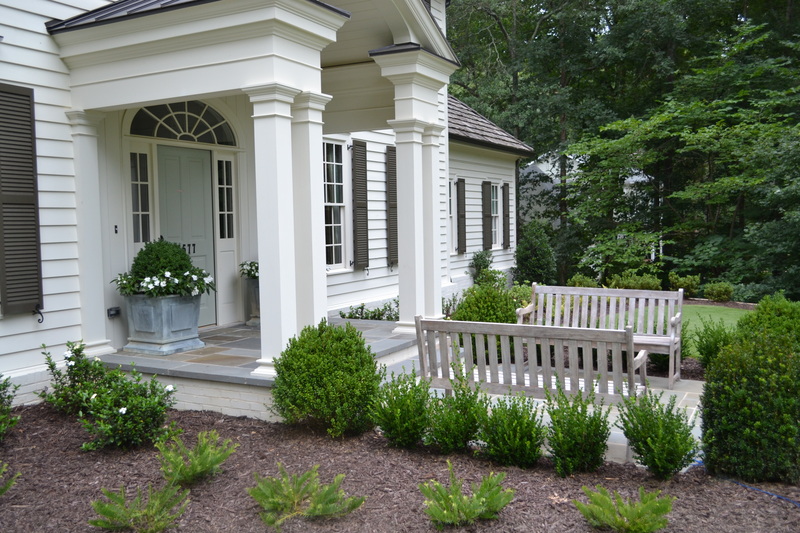 “White House with Boxwoods”- that is the search term I used to research the “look” we wanted for our home 5 years ago. 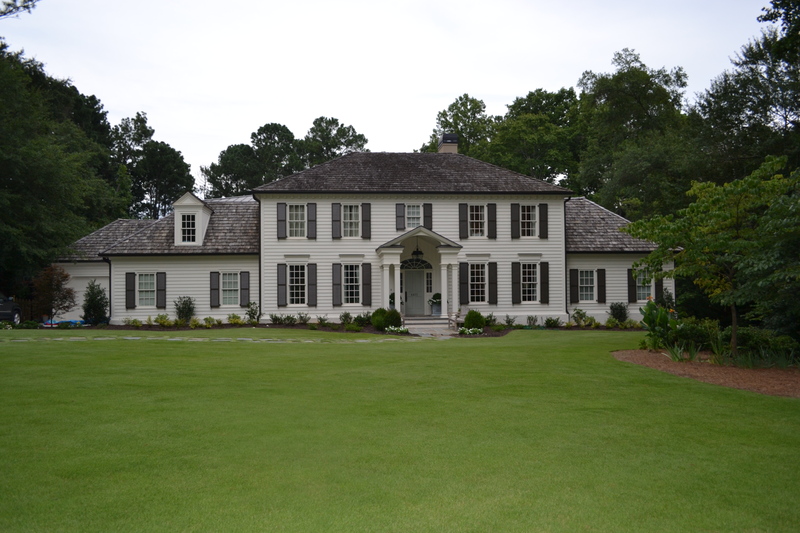 Today, the landscaping has mostly filled in and we have a white house with boxwoods but now it is not just a house, it is a home. It’s still not totally finished. We haven’t finished our basement how I would like to and we haven’t decided what we want to do with the back yard just yet but I still like looking at it when we pull up to the driveway each day! We used a warm gray, neutral background palette. Throughout our home, the walls are Benjamin Moore(BM) Revere Pewter and the trim is BM White Dove. On the main floor, we went with dark doors. The color is Sherwin Williams(SW) Urbane Bronze. Paint colors are so hard. Revere Pewter looks different in every room because the lighting in each room is unique. It goes with ANY color though. Right now, we have a blue and gold color accents throughout the main floor and it looks great with that. Upstairs, I have it mixed with pink and navy and it looks good with that too! It is an excellent, neutral, warm color. The dark doors are great. WIth four kids, doors take a beating and often end up with hand prints and smudges on them. The dark doors hide all of that! Artwork is from Ballard Designs and Sugarboo. Ottoman is from Wesley Hall and covered in a faux ostrich fabric I found on Etsy. Deer wax painting from a local Atlanta artist because every proper Southern home needs a deer head on the wall and this is my version because I don’t hunt animals. Starburst mirror is Home Depot. Our Keeping Room has lots of light. 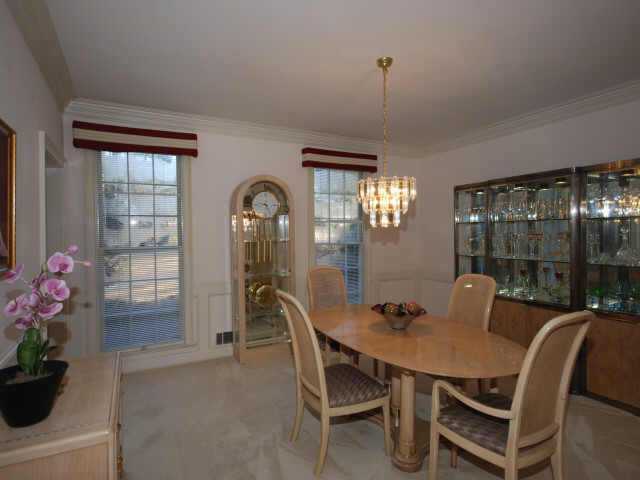 The trim in this room is painted Revere Pewter and the walls are White Dove. It is reversed and goes with the kitchen trim and cabinets. I love sectionals for TV watching. This room is used a lot by our family. The ceiling is planked. Lanterns are from Ballard Designs. Sectional is Clayton Green, custom. Kid table is an antique my mother hand finished. Breakfast area has tons of natural light. The table is custom made by a friend. Wood chairs are vintage and blue end chairs were a find from Homegoods. The ceiling light is from Ballard’s. The dining room received the most basic updates. We thought about doing away with it completely but I could never come up with another purpose so it is still with us. Funny story about the fabric for the window treatments. I went to Lewis and Sheron in Atlanta a while back to look for some fabric for various rooms. I saw this floral and just fell in love with it. I am usually NOT a floral kind of gal but the colors were right on and it just spoke to me. When I was ordering it, the woman that worked there asked me if I had kids. I told her I did and I had 3 girls. She said with this fabric, I can tell this is a happy home. I’m not sure if she is like a palm reader when it comes to fabric but she continued to tell me that my fabric choice meant our home was a happy home and whenever my kids were having a “moment” and needed to be reminded of how good they have it to simply stand them in front of the panel and that would turn their frown upside down. She said you can’t help but be happy when you look at this fabric. Sold me. I bought extra yards for pillows. Who knew happiness exists in drapery panels? Now you know! Well, it’s been a long time since my last post. We got distracted with life and pinterest! Lots of photos ended up on pinterest but I am going to try and go through and update what we ended up doing for each of the rooms. I think we stopped with the exterior! I will try to post pictures and info about each of our rooms so maybe it will help someone else that is thinking about going through this process. I used so many blogs, pinterest photos, etc when building our home. I was frozen without a reference photo. It’s hard not to be able to give specifics to your builder and not be clear on exactly what you will end up with. 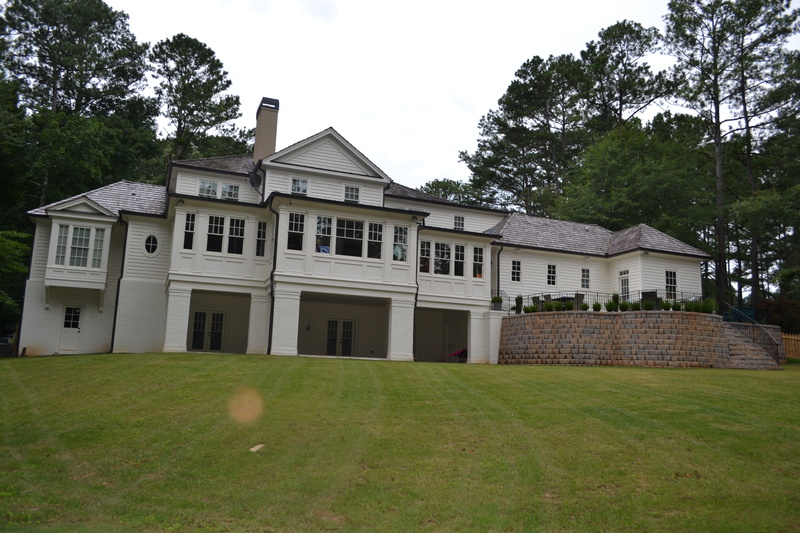 For now, here is a photo of the completed house. We were able to keep the cedar shake roof. The middle section(front) stayed up throughout the build and our builder was able to remove and save the old shakes from the two side sections that were taken down to the ground and rebuilt. They used the original shake on the front portion of the home when they put the roof back on and we added new cedar shake to the rear and sides and it has already the patina of the original shake. 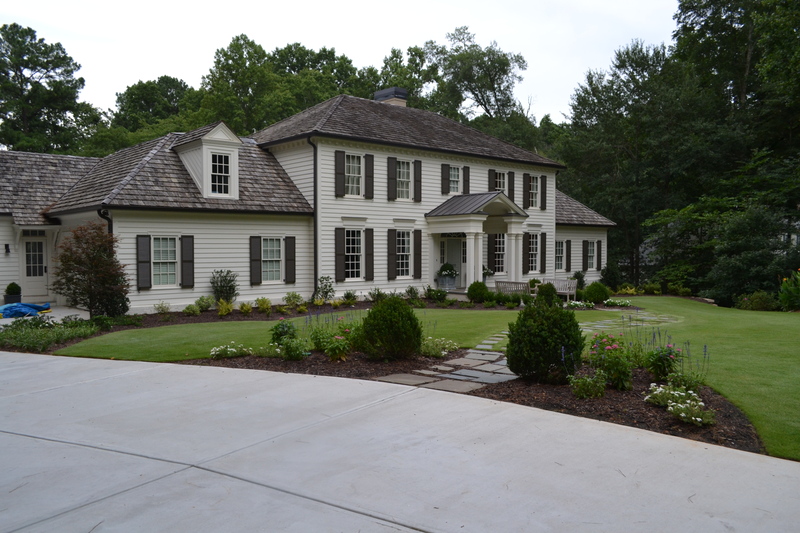 The home is a shade of white by Porter Paints and the shutters are a brown/grey color by Sherwin Williams. 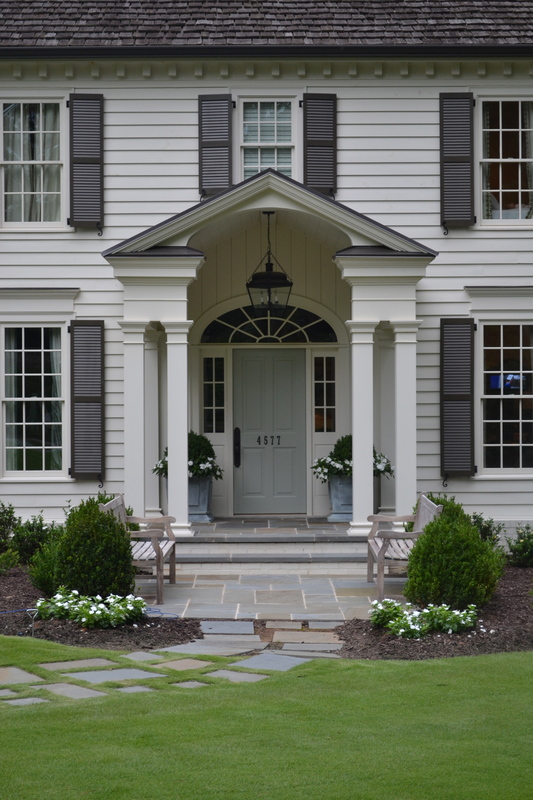 The front door is by Farrow and Ball- blue gray #91. We enlarged the lower bluestone patio so we were able to include two facing benches which I love! All of the boxwoods we requested too. I picked up the house numbers from Home Depot and installed them myself! The light is from Ballard Designs. All of my friends know I love Ballards and frequent the outlet weekly but I had to actually order this one which was painful for me! The planters I ordered from Restoration Hardware. I saw them pictured with the door color and the bluestone patio on a website and loved them. See, pictures help! The benches we procured from Hayneedle which is one of my new favorite online shopping sites! One of my favorite little things is the light we chose to use on the garage side of the house. 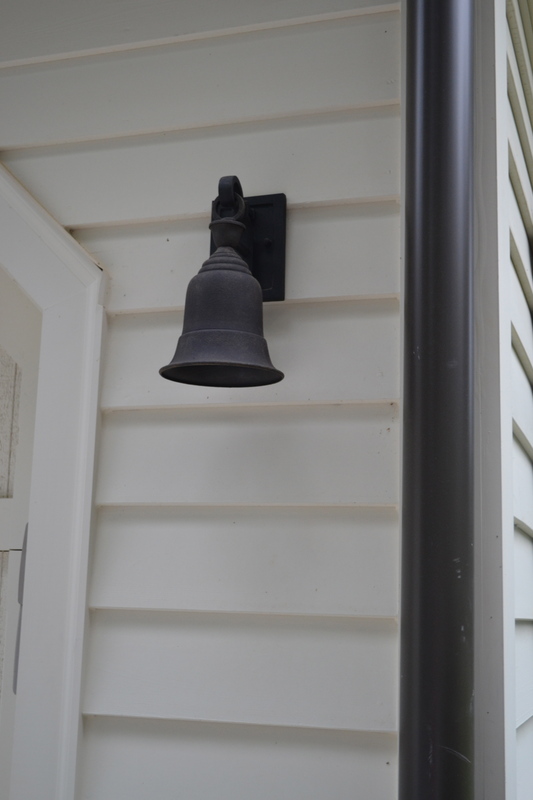 I spent many hours online looking at exterior wall lanterns. There are many good looking lanterns. These made me smile when I came upon them and the Liberty Bell look had an olden charm that spoke to me so this was the clear winner! The rear of the home is perhaps the biggest exterior change. We redid everything but kept the front true to its original build. The rear of the house, however, got a complete overhaul. We basically shaved off the back of the house and put an addition across the entire back. Thanks for Stephen Fuller, our architect, it is beautiful and light-filled like we had hoped. We painted all of the brick that remained and the brick that was added to match the house. That is one of the easiest ways to update an older home- ugly brick? Paint it! 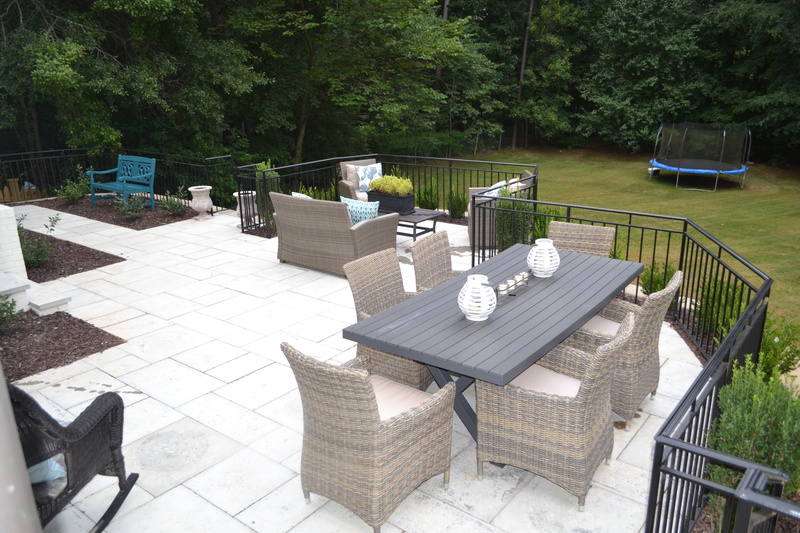 Lastly, the elevated patio which was one of the biggest nightmares to envision and create turned out to be both useful and pretty. Peacock Pavers from Atmore, Alabama was our paver choice because it does not heat up, even in the full sun. That’s all for now. I will start on the inside next!